What do people expect when they sign up to a linguistics experiment? First, a look at the distribution of email subjects. This reveals that most people know they are going to participate in an experiment, but fewer realise that they will contribute to research. One person thought that they would be doing a “Research Study”. What’s one of them? However, here’s the killer. 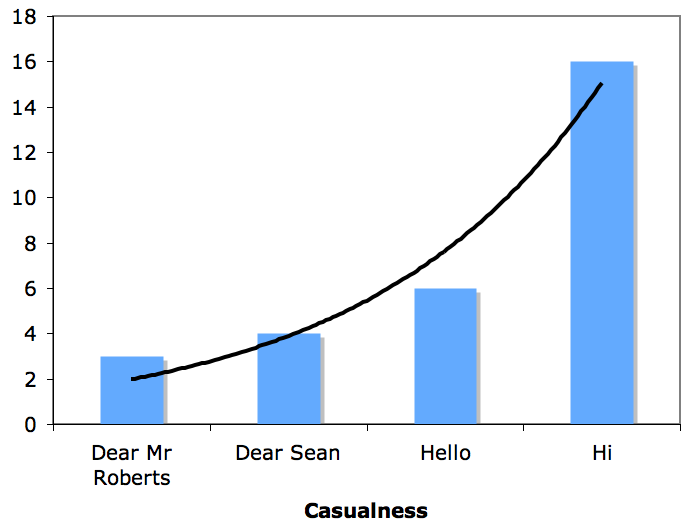 Analysing the first lines of the emails, I noticed a distinct power law relationship between frequency and casualness. People just don’t respect linguists any more. And that’s why I make people do hours of mind-bending iterated learning experiments with spinning cats. That is one of the best closing lines I have ever seen. Got a laugh out of this… I was reading your blog while running one of my participants on my own mind-numbing experiment. I feed them chocolate to keep them happy and alert. Previous Previous post: Are mirror neurons the basis of speech perception? Next Next post: The Interrogative Mood: A Novel?